Paperdolls Scrapping: 500th Sketch at Sketch Saturday! 500th Sketch at Sketch Saturday! Today is the 500th sketch at Sketch Saturday, which means it's time to celebrate! There are a TON of prizes up for grabs on the Sketch Saturday blog--so be sure to head over and join in for a chance to win! I have 2 cards to share for this sketch! The first card is primary colors, made with papers from my scrap drawer. The banner was cut using a Thinlets die from Sizzix. I used the same image in both cards, from Di's DigiStamps. I thought this cute little image was perfect for a Celebration card! It was colored with Copic Markers. The second was done in blues and greens. I knew I wanted to use the kaleidoscope paper for the background, so the other colors were picked to match that. The base was raised on 2 layers of foam tape so I could make this a shaker card, using some green chunky-glitter and matching beads. Both bees were also topped with some Wink of Stella and Accent Essentials. The background was sponged with Broken China Distress Oxide ink. I decided to put them both on Birthday bases that I printed on my HP printer. Thanks for looking! 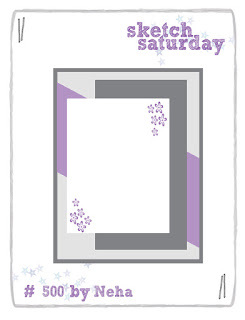 And as always please be sure to head over to Sketch Saturday to see what the other DT ladies produced!